The wonderful arm and side chairs are as comfortable as they are unique. 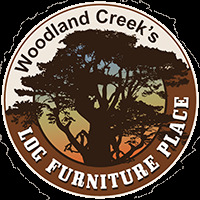 Hancrafted using small diameter lodgepole logs harvested in Montana and completed with a solid wood laminated seat, this log dining chair is designed to last for generations. Made in the USA, this chair incorporates the tried and true mortise and tenon joinery system that has served as a symbol of durability for millennia. Seat height is 18".